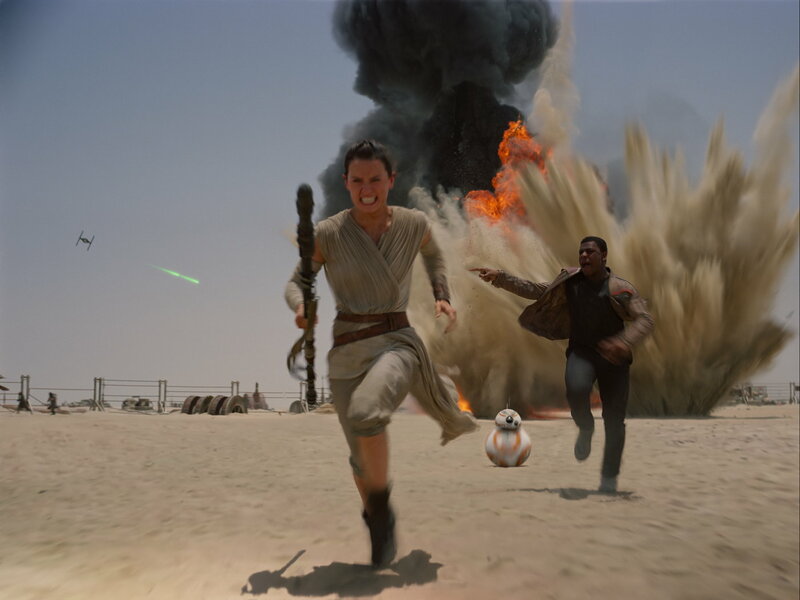 Even the most casual Star Wars fans have to admit how much fun “The Force Awakens” is. It's one of the most hyped films of this or any year and is destined to break every conceivable box office record. At least the movie deserves it because it certainly lives up to the hype and is a flat-out rollicking good time. Is it the best movie ever made? No. Is it the best film of the year? No. Is it the best Star Wars movie? It's hard to argue against that: only the die hard fans who like ALL SIX previous entries would be hard pressed to argue against “The Force Awakens” at least being on the same level as the original trilogy. Though it's probably the thirty two years since “Return of the Jedi” that would make anyone salivating for a glimpse at original characters Luke, Leia, and Han that make the wait worth it. “Star Wars The Force Awakens” works because director JJ Abrams (who also successfully reinvented Star Trek for modern audiences) has given his film an equally old school and modern vibe that feels like a comfortable pair of shoes. Best of all the film is purely and simply fun, which is what George Lucas intended a long time ago. No film review for a new Star Wars film would be complete without describing the plot but since it's one of the most secretive and hyped films ever what would be the point. Would describing the storyline really make anyone want to see the movie more than they already do? The plot is just fine. In fact it's not very far off from similar events we saw back in the 1977 original. We get a mix of human characters – who are all fantastic and instant classic additions to this world – and new droids and creatures who fit right in as well. One new character who practically needs no introduction is the spherical droid BB-8 who is one of the most charming and intriguing characters in quite some time. Like R2-D2 in the original series, BB-8 conveys such much personality and emotion without ever saying a word. All we get is a bunch of beeps, boops, and gestures. The practical mechanical effects are jaw-dropping. Most actors working these days should be severely jealous of this character. The new humans are great too there's Rey (Daisy Ridley) a longer scavenger, Finn (John Boyega) a storm trooper with a big heart, and Poe (Oscar Isaac) a top Resistance pilot. The bad guy is Kyo Ren (Adam Driver) leader for the nefarious New Order and this mysterious new character makes for a fascinating Darth Vader-like villain. The familiar characters from the original trilogy appear in varying roles. It's wonderful seeing them again. You'll probably cry just at the sight of them. Enough of that. It must be said that many wondered what a Star Wars film would be like without the imput of its creator George Lucas. The torch has been carefully passed. Everything hear feels like something Lucas would approve from the look of the weird creatures who populate this world to the past references and allusions to the previous films. You get the sense of respect that Abrams has brought to the film. And it makes sense as one of Abrams co-screenwriters was none other than Lawrence Kasdan who also co-wrote Episodes V and VI. "Little Miss Sunshine" screenwriter Michael Ardnt gets credit as well. I was actually quite surprised at the overall look of the film. Abrams is known for his visual style that he brought to the Star Trek films like shakey camera, fast editing, and all those lens flairs. Cinematographer Daniel Mindel tones things down fittingly as if every executive was hovering over him the entire time. He somehow gives the film an old school look with modern effects that works magically. The 3D also adds another level of fun; there are so many ships, lasers, and lightsabers coming out at you the film not surprisingly feels like a Disney World ride. And let's not forget John Williams music which is probably half of the reason why Star Wars was so successful in the first place. Trailer for Star Wars: Episode VII - The Force Awakens on TrailerAddict.